On the surface, the film industry and central banking have little in common. Each does its own thing with little regard for the other. But in fact, they’re more alike than either cares to acknowledge. Film executives must analyze the vast, constantly shifting data surrounding public preferences, make long-term financial commitments that aren’t easy to reverse, and then live with the consequences. Central bankers must do the same. Hollywood execs dress more fashionably, but otherwise they have a lot in common with Fed governors. There’s one big difference, though: Hollywood’s financial mistakes hurt mainly Hollywood, but the Fed’s mistakes hurt almost everyone. Hollywood executives have their own skin in the game. They live with the financial consequences of their decisions. The members of the Federal Open Market Committee not only have no skin in the game; if something goes wrong, they will blame capitalism and free markets and thereby relieve themselves of the consequences of their own decisions and manipulations. And then they will go on manipulating the markets to far more applause than they deserve, in the attempt to clean up the consequences of their own mistakes. Let’s be clear. The financial crisis of 2007–08 was the result of Federal Reserve errors and the regulatory failures of government agencies. However, if we ask who makes more blockbusters while operating on flawed and limited information, Hollywood wins easily. It has the occasional Gigli or Heaven’s Gate, but the Fed remakes Ishtar every few years and thinks everything is fine. Today we’ll extend last week’s discussion by considering how twisted inflation data leads to less-than-ideal policies. But first, let me again suggest that you get a Virtual Pass to my upcoming Strategic Investment Conference. We’ve added several new features this year. • (New) 20+ hours of video recordings: Fine-tune your portfolio for 2018 and beyond with the help of 20+ hours of video recordings from the SIC. The video recordings of each session will be uploaded to the buyers-only website within 24 hours after the event. • (New) Live video stream from SIC 2018: For the first time ever, you can watch the 20+ hours of presentations and panels LIVE from the conference. • (New) Submit questions to the SIC speakers: This new function lets you ask the speakers questions in real time. At the end of each session, there is time for Q&A. With your Virtual Pass, you can submit your most pressing questions, and the top-rated questions will be put to the speakers. • Hassle-free audio recordings: Your MP3 download means you can listen to SIC 2018 anytime, anywhere, and on almost any device. • Information-packed slide presentations: The speakers’ sessions come with their slide presentations in easily accessible PDF format, so you can peruse key points and data at your leisure. The slides allow you to follow along with the speaker’s presentations and spot key trends of your own. They will be the source of many more investment insights and ideas. • Transcripts: You will also get transcripts of all presentations and panels taking place. With the transcripts, you can quickly find the key points you are looking for in a presentation. In the US we have two different inflation measures, produced by agencies of two different cabinet departments. The Federal Reserve prefers to look at the Commerce Department’s Personal Consumption Expenditures (PCE) Index, because they believe it is more comprehensive and nuanced than the Labor Department’s Consumer Price Index (CPI). Are they right? In a moment I will talk about the differences, which are important; but I think the Fed is exactly backwards here. Neither measure is particularly foolproof, but the flexibility and adjustments that make the Fed prefer PCE also take the index further from reflecting the average citizen’s economic condition. This bias shows up in Fed policy, and not in a good way. That doesn’t mean the CPI is wonderful, though. Unlike some, I don’t believe it is intentionally manipulated. I think the wonks (and I say that in a complimentary way, as a fellow wonk) who compile price data do a nearly impossible job as well as anyone can. • Price indexes are available for the US, the four Census regions, nine Census divisions, two size of city classes, eight cross-classifications of regions and size-classes, and for 23 local areas. Indexes are available for major groups of consumer expenditures (food and beverages, housing, apparel, transportation, medical care, recreation, education and communications, and other goods and services), for items within each group, and for special categories, such as services. • More detailed item indexes are available for the US than for regions and local areas. • Indexes are available for two population groups: a CPI for All Urban Consumers (CPI-U) which covers approximately 94 percent of the total population and a CPI for Urban Wage Earners and Clerical Workers (CPI-W) which covers 28 percent of the population. • Some series, such as the US City Average All items index, begin as early as 1913. All that data gets worked into “baskets” that try to match the spending habits of typical consumers. That’s where the effort starts going wrong. The problem is quite simple and beyond anyone’s control: None of us are average. We all spend our money differently, for an endless variety of reasons that change all the time. When you say inflation is higher than CPI shows while your neighbor says inflation is no big deal, you can both be right. Worse, even someone with spending patterns identical to yours can experience an entirely different inflation rate simply because they live in a different city or state. Or they choose to send their kids to a more expensive school. Or they spend a larger amount on health care and less on goods but more on services. It can get quite nuanced. Reducing this complexity to one number and then using that number to guide monetary policy is asking for trouble. And trouble is what we get. CPI isn’t entirely useless. It can show us broad price trends over long periods. Those trends can reveal some things, as shown in this 20-year American Enterprise Institute chart that’s making the rounds this month. It is notable that the two big outliers to the upside are health care (hospital, medical care, prescription drugs) and college (tuition, textbooks, etc.). Wages have barely ticked over the median inflation measure, but that did not stop some people from blaming the correction on rising wages. Reading the pundits, I cannot tell which fate awaits us: the robot-driven apocalypse where we are all out of work, or the inevitable spike in wages that sends rates much higher and kills the market. Perhaps both – higher wages sends employers into the waiting arms of our automated future. You can quibble with this data. Have TV prices really fallen 99%? No, unless you hedonically adjust, because today we can buy TVs of a quality that didn’t exist in 1997. If you use hedonic prices, adjusting for quality and technological sophistication, then you can argue that the price of TVs is down 99%. But we all know that we are paying less for TVs. Same for other technology goods. But you simply cannot argue that we are paying the same now for new vehicles as we did 20 years ago, even though the cars we buy today are technologically vastly superior to what we could buy back then. These hedonic price adjustments are guesswork. Still, the broader point seems right. Inflation is a real problem for some people and no big deal for others, yet the Fed uses inflation measures to impose a single monetary policy on everyone. Is it any wonder that policy doesn’t work for many of us? 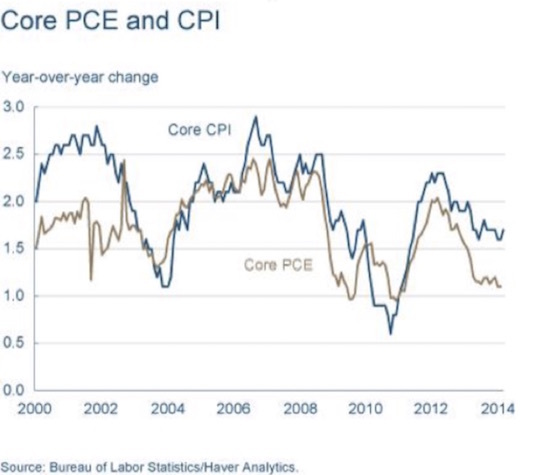 The Federal Reserve prefers to use core PCE rather than core CPI. The Cleveland Fed has a very good basic explanation of the differences between the two indexes. 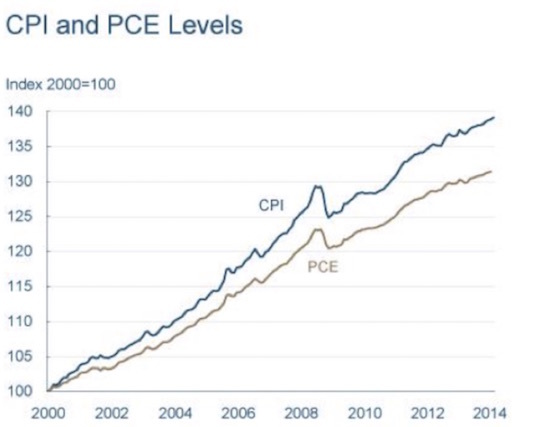 A glance at their charts, below, will show that core PCE (Personal Consumption Expenditures) is significantly lower than core CPI (Consumer Price Index). After the charts, I will quote a few paragraphs from the Cleveland Fed. What accounts for the difference between the two measures? Both indexes calculate the price level by pricing a basket of goods. If the price of the basket goes up, the price index goes up. But the baskets aren’t the same, and it turns out that the biggest differences between the CPI and PCE arise from the differences in their baskets. The first difference is sometimes called the weight effect. In calculating an index number, which is a sort of average, some prices get a heavier weight than others. People spend more on some items than others, so they are a larger part of the basket and thus get more weight in the index. For example, spending is affected more if the price of gasoline rises than if the price of limes goes up. The two indexes have different estimates of the appropriate basket. The CPI is based on a survey of what households are buying; the PCE is based on surveys of what businesses are selling. Another aspect of the baskets that leads to differences is referred to as coverage or scope. The CPI only covers out-of-pocket expenditures on goods and services purchased. It excludes other expenditures that are not paid for directly, for example, medical care paid for by employer-provided insurance, Medicare, and Medicaid. These are, however, included in the PCE. Finally, the indexes differ in how they account for changes in the basket. This is referred to as the formula effect, because the indexes themselves are calculated using different formulae. The details can get quite complicated, but the gist of the matter is that the PCE tries to account for substitution between goods when one good gets more expensive. Thus, if the price of bread goes up, people buy less bread; and the PCE uses a new basket of goods that accounts for people buying less bread. The CPI uses the same basket as before (again, roughly – the details get complicated). Now, in conversations with my friend and fellow wonk Peter Boockvar, he has pointed out other, more nuanced differences. The inclusion of government-priced medical care, such as Medicare, where the government manipulates what they will pay, significantly reduces the healthcare inflation of the PCE. And as noted above, the PCE assumes that if the price of something – beef, for instance – goes up, consumers will buy less beef and more chicken, which is cheaper. You can make the argument that the PCE is biased toward returning lower inflation numbers, but that tendency is almost beside the point. The technical differences between the two indexes make for extraordinarily economically dense discussions, and I’m sure the issues are debated heatedly at certain conferences that focus on such things, but both measures are honest attempts to understand what inflation is and how it affects us. Neither index necessarily reflects the inflation that you are personally experiencing, or the inflation of your particular area or region. And similar differences pertain in every country of the world. But in most countries, inflation affects the bottom 50% more than it does the top 50% by income. 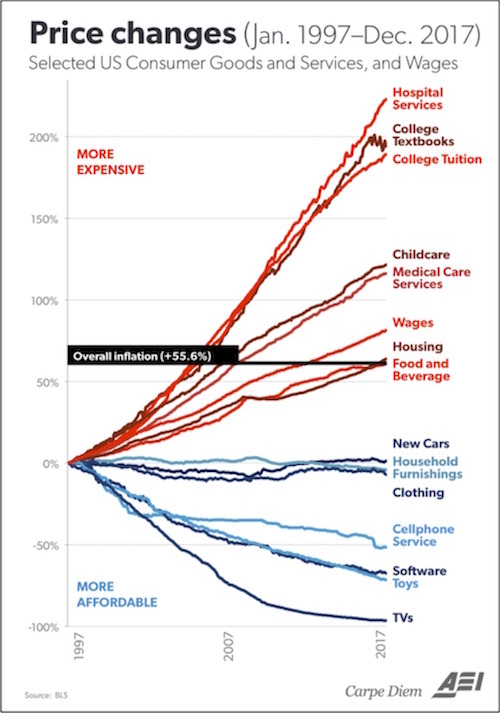 Because there are certain necessities of life that must be purchased, and because many of those goods and services (such as housing, and health care) have higher than average inflation, the bottom half suffers a much higher inflation rate than the overall national average. And yet, a national inflation policy geared to the lower 50% would aggressively skew monetary policy in a negative fashion. Sidebar: PCE and CPI use different measures and percentages for housing costs. CPI uses something called Owner’s Equivalent Rent, which is a hypothetical number based on certain assumptions. Here’s a thought project. At one time the US used actual house prices to measure inflation, as Europe does today. If we had been using actual house prices during the period 2000 to 2008, the Fed would have been raising rates aggressively, trying to lean into the inflation caused by the increase in house prices, thereby likely avoiding the housing bubble but creating a recession earlier than 2008, for entirely different reasons. In theory, we want “price stability,” which would mean the absence of either inflation or deflation. When Greenspan was asked, when he was chairman of the Fed, what is meant by price stability, he answered “Zero.” None of this 2% inflation target. “Price stability” is the obsession of central bankers everywhere, and in some places is their legal mandate. They currently like having just a little inflation but not too much. The Fed wants 2% and can’t even deliver that, if you define inflation by CPI or PCE. People think that 2% coming. Maybe so. However, maybe we should all think about this issue differently. Last week I ran across a December 2017 Project Syndicate article by good friend William White, formerly Bank of International Settlements chief economist and now with the OECD. White says central banks rightly responded to 1970s inflation by clamping down hard, but then failed to adjust when conditions changed. That oversight led directly to some of today’s problems. From the late 1980s onward, low inflation was largely due to positive supply-side shocks – such as the Baby Boomer-fueled expansion of the labor force and the integration of many emerging countries into the global trading system. These forces boosted growth while lowering inflation. And monetary policy, far from restricting demand, was generally focused on preventing below-target inflation. The fixation on keeping inflation low, according to White, has driven up global debt ratios, squeezed lender margins, and forced lending activity into an opaque shadow banking sector. All these effects raise systemic risks that will probably bite us eventually. These developments constitute a threat not just to financial stability, but also to the workings of the real economy. Moreover, one could argue that easy money itself has contributed to the unexpectedly strong disinflationary forces seen in recent years. Owing to easy financing and regulatory forbearance, aggregate supply has risen as “zombie” companies have proliferated. Meanwhile, aggregate demand has been restrained by the debt headwinds – yet another result of easy monetary conditions. This insight isn’t intuitive to many economists. Easy credit – as the Fed gave us for the last decade – should raise inflation, not reduce it. Bill says no; it allows zombie companies to survive and overproduce, while putting consumers in so much debt that their spending gets constrained. So it pushes inflation down instead of up. Wrap your head around that thought. It answers some riddles that otherwise make little sense. But it also highlights the difficulty of formulating sane policy. Yes, it’s important to let zombie companies die. Creative destruction and all that. But real people work for the zombies, earning real money that lets them buy goods and services and keep the economy moving. So what do you do? None of the choices are painless. Too often, we simply redistribute the pain to those least able to bear it, who are understandably unhappy – hence the present social and political tensions. They all trace back to economics. Is data boring? Yes. It’s often wrong and misleading, too. But ignoring it to fly by the seat of our pants isn’t the right response, either. We need much better understanding and application of all these numbers, and I see very few economists trying to deliver either. That’s the core problem. This last week was rather exhausting, with late planes and long flights. But I am now back in Dallas and think I will take a little time to relax before plunging into the week on Monday morning. With the exception of speeches and business all day Tuesday, my focus will be on the final plans and my topics for the Strategic Investment Conference in San Diego March 6–9. The conference will be well attended, and as usual almost half of the attendees have been to more than a few SIC conferences, so I will be among old friends. I will spend much of the week talking with the speakers and getting a sense of what they will say, so that I can make sure that I have everything and every topic in its proper order. I must say, what I have heard so far has shown me a surprise here and there, as it seems many are expecting changes and adapting their own businesses and outlooks. If nothing else, it promises to be a week of revelation. I know my editors are working to pare back my letter, as we are trying to keep it shorter, so I’m going to help them this week by limiting my personal comments to wishing you a great week and hoping that you will find time to be with friends and family. 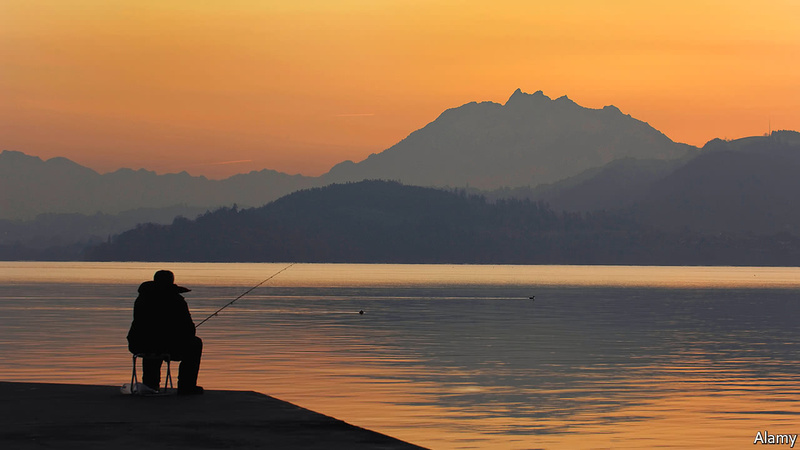 ON A clear day, sunset over Lake Zug is magnificent. Snow-dusted mountains cut through the orange glow above and are mirrored in the lake below. “Zug is our spiritual home,” says Jeremy Epstein, from Washington, DC, who has just taken 40 foreigners to tour the small Swiss town south of Zurich. They came not for sunsets, though, but to find out how Zug has become known as “crypto-valley”—meaning the home of many firms dealing in crypto-currencies and related activities. Switzerland’s famous banking secrecy is falling to a global assault on money-laundering and tax evasion. But financial security remains in demand. The country should seek to become the “crypto-nation”, said the economy minister, Johann Schneider-Ammann, last month. Zug aims to be the capital of that nation. To that end, Switzerland is maintaining loose rules for crypto-businesses, even as other countries are tightening theirs. An industry is developing to store tangible crypto-assets, such as the hard drives on which cryptographic keys are stored, offline in cold, dry, secret sites complete with rapid-response teams. Where better than a decommissioned military bunker in the Swiss Alps? In Zug, friendliness to crypto-currencies is in evidence all around. “Bitcoin accepted here” stickers adorn the city hall and several shops, including the wine merchant’s. In 2016 Zug became the first place in the world to accept bitcoin for some public services. Residents can get a blockchain-based digital identity. About a quarter of last year’s global total of $5bn in initial coin offerings (ICOs, a form of crowdfunding whereby investors are issued with digital tokens) was raised in Switzerland, estimates PwC, a consultancy. Of the ten largest ICOs, four were in part based in Zug. The town decided early on to attract crypto-entrepreneurs, for example by allowing companies to incorporate based on bitcoin wealth, rather than insisting that it be converted into fiat currency. Taxes have long been low. After the second world war the former fishing village cut its corporate-tax rate to 8.5%. The rate is still competitive, at 14.6% compared with Zurich’s 21%. The crypto-chapter of Zug’s history began in earnest in 2013 when the Ethereum Foundation, a non-profit to support the development of the eponymous blockchain, based itself there. More crypto-firms followed. Now, having dealt with 150-odd of them, the local tax authorities are experts, as are the accountants and lawyers. Switzerland’s decentralised government, direct democracy and history of libertarianism are all essential to Zug’s success. These contrast with rival hubs such as Hong Kong and Singapore, and appeal to fans of blockchain technology, which underlies most crypto-currencies and is essentially a distributed ledger maintained collectively by some users. There are practical benefits for crypto-entrepreneurs, too. The federal government takes a light approach to regulation in general, and to new technologies in particular. Cantons have wide latitude in how they deal with companies. A fintech licence, expected to become available next year, should make life even easier for fintech startups. Regulators elsewhere see it as their job to protect consumers from dubious new crypto-currencies. But Switzerland’s take a more bracing approach. “Our consumers should have the freedom to invest in exotic instruments, even gamble,” says one official. Jörg Gasser, the state secretary for international finance, has little doubt that, if and when the bitcoin bubble bursts, investors will ask for regulation. But, he says, the sector must not be regulated to death. Crypto-entrepreneurs took the measured tone as indicating that Switzerland is still keen on their business. Indeed, as the sector matures, places that offer some regulatory protection or licensing should benefit, says Joey Garcia, a lawyer at Isolas LLP, who has just helped develop a licensing system in Gibraltar, a rival crypto-centre. 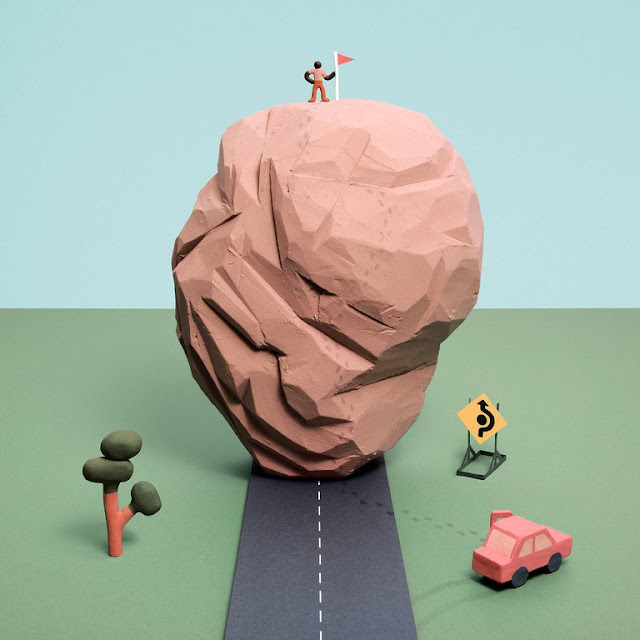 While crypto-companies are growing, physical hubs with well-crafted rules and a critical mass will continue to seem attractive. But crypto-currencies’ intrinsically decentralised nature means that eventually the benefits of being part of a cluster may weaken. Unless Zug continues to court them, only the vaults carved into the Swiss granite will stand the test of time. Here is a recipe for disaster. You start off by taking the two most toxic financial instruments of the past 20 years, and then merge them. The first is the collateralised debt obligation, the complex instrument at the heart of the US subprime crisis a decade ago. The financial sector created a housing boom through a relaxation of lending standards, transformed the mortgages into complex CDOs, and then sold them off to unsuspecting investors. Next, you take a much more innocent-looking instrument: a sovereign bond from a eurozone country. They are actually risky assets because eurozone countries issue sovereign debt but no longer have their own autonomous central bank as a buyer of last resort. This is why the eurozone debt markets are inherently more crisis-prone than those of countries with an independent monetary policy. As a next step, you mix these two very different instruments according to the following instructions: you take government bonds of all or some of the eurozone members and turn them into a CDO. You call them European Safe Bonds — or ESBies. ESBies are European. They are safe because it says so on the label. And they are bonds. So what is not to like? For starters, the CDO scam of the subprime years critically relied on collusion from rating agencies, and the rating agencies have learnt their lesson. The high ratings they used to give to CDOs were based on a misjudgment, deliberate or otherwise, on the nature of the risk. A single housing loan can always go bad. In good times, such a risk can be neutralised. But if the entire housing market crashes, many loans go bad at the same time. Risk correlation was also a big problem for sovereign bonds during the eurozone crisis. The two situations are therefore comparable. Standard & Poor’s said last year that it would rate ESBies in the lower half of the investment-grade spectrum. One would have assumed that alone would have killed the idea. But a version of the ESBies has made a surprise comeback in a recent paper by a group of French and German economists, who set out to bridge their countries’ differing views on how to reform the eurozone. One gets the sense that the authors’ knowledge of the academic financial market literature exceeds their knowledge of the reality of financial markets. ESBies have another, more serious problem. They cannot take over the collateral function of ordinary government bonds. Modern economies need large volumes of safe assets to grease the huge volumes of daily money market transactions. Safe assets are used as collateral in so-called repurchase agreements, or repos, one of the largest sections of the money market. From a purely financial perspective, the eurozone crisis started with a realisation among investors that the bonds of the peripheral eurozone countries were not safe. The crisis ended when Mario Draghi, president of the European Central Bank, gave an unlimited pledge to buy “whatever it takes”. This was followed a few years later by actual purchases of government debt. As a byproduct of the ECB asset purchase programme, the eurozone gained a safe asset in virtual form. As of the end of January, the ECB held €2.3tn in assets from its purchases of government bonds. The purchases are likely to be phased out this year, but for as long as the ECB maintains the existing stock, the eurozone already has a rock-solid, albeit synthetic, eurobond. The bonds held by the ECB constitute an available pool of assets to be used as collateral for repos. To avoid a potential collateral squeeze, the ECB has become the critical player in maintaining an orderly repo market. If the ECB were to switch from buying assets to selling assets, and wind down the actual stock of government bonds, the eurozone would then have to rely on national bonds or synthetic ESBies for financial stability. Good luck with that! Not much harm would be done if the eurozone states created ESBies as some kind of public relations exercise, as a token symbol of their togetherness. This is all fine for as long as the ECB does the heavy lifting. But it does not take much imagination to come up with a scenario where that might no longer the case. In the developed nations of the 21st century, convenience — that is, more efficient and easier ways of doing personal tasks — has emerged as perhaps the most powerful force shaping our individual lives and our economies. This is particularly true in America, where, despite all the paeans to freedom and individuality, one sometimes wonders whether convenience is in fact the supreme value. As Evan Williams, a co-founder of Twitter, recently put it, “Convenience decides everything.” Convenience seems to make our decisions for us, trumping what we like to imagine are our true preferences. (I prefer to brew my coffee, but Starbucks instant is so convenient I hardly ever do what I “prefer.”) Easy is better, easiest is best. Convenience has the ability to make other options unthinkable. Once you have used a washing machine, laundering clothes by hand seems irrational, even if it might be cheaper. After you have experienced streaming television, waiting to see a show at a prescribed hour seems silly, even a little undignified. To resist convenience — not to own a cellphone, not to use Google — has come to require a special kind of dedication that is often taken for eccentricity, if not fanaticism. By the late 1960s, the first convenience revolution had begun to sputter. The prospect of total convenience no longer seemed like society’s greatest aspiration. Convenience meant conformity. The counterculture was about people’s need to express themselves, to fulfill their individual potential, to live in harmony with nature rather than constantly seeking to overcome its nuisances. Playing the guitar was not convenient. Neither was growing one’s own vegetables or fixing one’s own motorcycle. But such things were seen to have value nevertheless — or rather, as a result. People were looking for individuality again. You might date the beginning of this period to the advent of the Sony Walkman in 1979. With the Walkman we can see a subtle but fundamental shift in the ideology of convenience. If the first convenience revolution promised to make life and work easier for you, the second promised to make it easier to be you. The new technologies were catalysts of selfhood. They conferred efficiency on self-expression. Consider the man of the early 1980s, strolling down the street with his Walkman and earphones. He is enclosed in an acoustic environment of his choosing. He is enjoying, out in public, the kind of self-expression he once could experience only in his private den. A new technology is making it easier for him to show who he is, if only to himself. He struts around the world, the star of his own movie. So alluring is this vision that it has come to dominate our existence. Most of the powerful and important technologies created over the past few decades deliver convenience in the service of personalization and individuality. Think of the VCR, the playlist, the Facebook page, the Instagram account. This kind of convenience is no longer about saving physical labor — many of us don’t do much of that anyway. It is about minimizing the mental resources, the mental exertion, required to choose among the options that express ourselves. Convenience is one-click, one-stop shopping, the seamless experience of “plug and play.” The ideal is personal preference with no effort. We are willing to pay a premium for convenience, of course — more than we often realize we are willing to pay. During the late 1990s, for example, technologies of music distribution like Napster made it possible to get music online at no cost, and lots of people availed themselves of the option. But though it remains easy to get music free, no one really does it anymore. Why? Because the introduction of the iTunes store in 2003 made buying music even more convenient than illegally downloading it. Convenient beat out free. 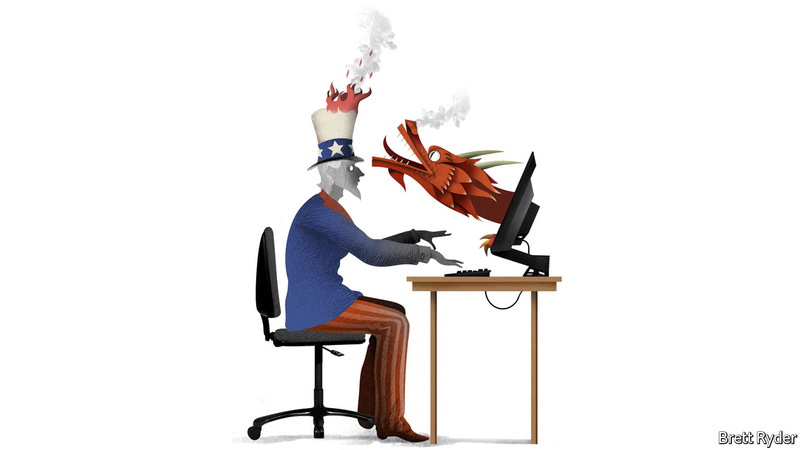 How does Chinese tech stack up against American tech? Putin’s mercenaries are bloodied in Syria, as he tries to drive Trump out. The truth is starting to emerge about a recent Russian attack on U.S. forces in eastern Syria, and it deserves more public attention. The assault looks increasingly like a botched attempt to bloody the U.S. and intimidate President Trump into withdrawing from Syria once Islamic State is defeated. The U.S. military won this round, but Vladimir Putin’s forces will surely look for a chance at revenge. Ms. White wouldn’t confirm how many attackers were killed or who was fighting, though the U.S. had “observed” the military buildup for a week. Defense Secretary James Mattis called the confrontation “perplexing,” adding that “I have no idea why they would attack there, the forces were known to be there, obviously the Russians knew.” He’s referring to the U.S.-Russia “deconfliction” agreement in which the Russians agreed to stay west of the Euphrates River. That depends on how you define “Russian military.” Evidence is growing that the attack was orchestrated by Yevgeny Prigozhin, the Russian oligarch who does much of Mr. Putin’s dirty work. His businesses include the Internet Research Agency, a media operation indicted by a federal grand jury last week for meddling in the 2016 U.S. election. Mr. Putin has a history of using mercenaries in Crimea and southern Ukraine, the better to preserve deniability if something goes wrong. The Obama Administration blacklisted Mr. Prigozhin in 2016 for supporting Russia’s Ukraine invasion, and in June the Trump Administration sanctioned Dmitry Utkin, a former Russian intelligence officer associated with Mr. Prigozhin’s Wagner Group of mercenaries. Wagner has been fighting in Syria since 2015, according to the Institute for the Study of War’s Bradley Hanlon, including campaigns to retake oil-rich areas. 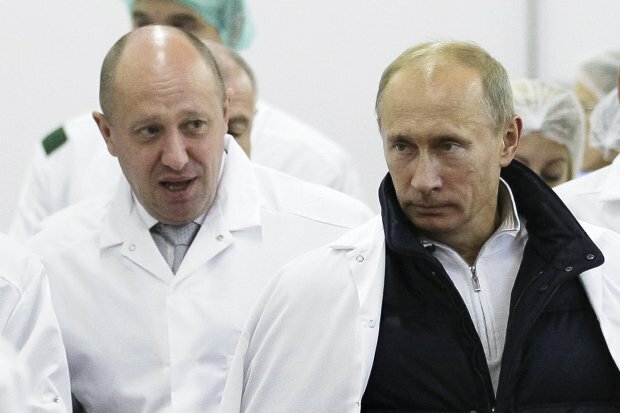 Mr. Putin has been doling out contracts tied to oil and mining to mercenaries in Syria, including to Mr. Prigozhin. The Washington Post reported Thursday, citing intelligence sources, that Mr. Prigozhin had “secured permission from an unspecified Russian minister” for the attack and had also “discussed” it with Syrian officials. Mr. Prigozhin would never undertake such an operation unless he felt he had clearance from the highest levels of the Kremlin. Why risk such an attack, especially given how badly it went for Russia? Mr. Putin is constantly probing for weaknesses in adversaries, and perhaps he wanted to embarrass Mr. Trump by capturing some Americans. Perhaps he hoped to push the U.S. troops back and seize the nearby oil fields. With Mr. Trump sending no clear signals about U.S. intentions after Islamic State, and given his 2016 campaign claims that Syria is someone else’s problem, Mr. Putin might have thought that some American casualties, prisoners or a retreat would increase calls inside the U.S. to leave Syria. The U.S. military response was impressive and laudable, but American silence about the Russian attack is puzzling. The attack shows again that Mr. Putin is looking to damage U.S. interests wherever he sees an opportunity, even at the risk of a U.S.-Russia military engagement. Maybe Mr. Trump doesn’t want to humiliate Mr. Putin, but the Russian won’t forget this defeat merely because the U.S. is quiet about it. The danger is that he’ll interpret U.S. silence to mean that he can risk an attempt at revenge. Mr. Putin is running for re-election this spring, and while he has rigged the vote to guarantee victory, the Russian public needs to know his mercenaries suffered a humiliating defeat. If the U.S. won’t tell the truth, Mr. Putin has an easier time telling lies. The Russian engagement also shows that the U.S. is operating a de facto safe zone for allies in eastern Syria. The Pentagon is still pursuing dispersed Islamic State fighters, but another goal is to influence the shape of post-ISIS Syria. Mr. Putin wants to push the U.S. and its allies out so its axis with Iran can dominate Syria. Look for more such confrontations to come. Roughly two weeks later, Trump did something that garnered far less attention in the media than his chocolate cake comment but was far more important. On April 19, the Department of Commerce initiated an investigation into whether foreign imports of steel threatened U.S. national security. The next day, Trump signed a memo urging that the investigation be carried out “expeditiously.” A week later, Trump expedited an investigation into the national security implications of U.S. imports of aluminum. It took a little less than a year, but the Commerce Department concluded its investigations on Feb. 16 – and the results give Trump significant new powers. The immediate effect of the Commerce Department’s conclusions will give Trump broad and wide-ranging powers when it comes to U.S. imports of aluminum and steel. The words and the choreography actually matter here. A U.S. president does not have the authority to levy tariffs or set import quotas by virtue of being president. On the contrary, the president must be authorized to make such a move. The previous administration provides a useful example. In September 2009, former President Barack Obama slapped a 35 percent tariff on Chinese tires. Obama was able to do so only because a union had petitioned the United States International Trade Commission, which subsequently ruled that U.S. tire manufacturers had been materially injured by unfair Chinese trade practices related to tires. Obama followed the USITC’s recommendation and imposed the tariffs. That is a lot of hoops to jump through. The Trump administration came into office promising significant changes in U.S. trade policies. Thus far, the administration’s trade policies haven’t been materially different than those of past administrations, but it has not been for lack of desire. When Trump met with Xi last April, he had little choice but to craft a face-saving compromise on North Korea because Trump had no way to follow through on his economic threats. What Trump needed more than anything was to buy time for his administration to create the tools necessary to follow through on its threats. In effect, Trump set Xi up. If Xi followed through on North Korea, Trump could claim success for solving the North Korea issue. If Xi didn’t follow through, Trump could enact punitive trade measures and use Xi’s failure to underscore the threat China poses to U.S. national security. Most media reporting is portraying the Commerce Department’s recommendations as the first potential salvo in a U.S.-China trade war – and the Chinese Commerce Ministry’s immediate reaction, threatening potential retaliation, did nothing to dissuade this interpretation. But the U.S. actually does not import much Chinese steel. According to the latest data (from the third quarter of 2017), the top three sources of U.S. imports of steel are Canada, Brazil and South Korea. In fact, China isn’t even in the top ten. The story is a little different when it comes to aluminum, however. China is the second-largest source of U.S. aluminum imports and the U.S. accounts for 18 percent of China’s aluminum exports – a significant, but hardly overwhelming share. The deeper problem is not U.S. imports of Chinese steel and aluminum, but that China is producing such vast quantities of steel and aluminum, driving global prices so low that U.S. companies cannot compete. The sheer scale of Chinese production of steel and aluminum is mind-boggling. In 1967, China produced 2.1 percent of the world total. In 2016, it produced 49.6 percent. The data for aluminum doesn’t go quite that far back, but in 1999, China produced 11 percent of the world’s aluminum. Last year, it produced 56.7 percent. Even the significant powers Section 232 can confer do not give Trump a magic wand to increase prices or compel China to curb production because from China’s perspective, making cuts like that is a matter of its own national security. While China’s market share increased slowly as Deng Xiaoping’s reforms took root in the 1970s and 1980s, China’s global share of production rose significantly around the time of the 2008 financial crisis, when China relied on massive amounts of stimulus to keep its economy from crashing due to a decline in demand for its exports. China did not want to lay off workers, so it kept producing steel that no one needed, building ghost cities that no one could afford to live in and giving loans to companies that weren’t profitable enough to pay workers. The fairly superficial cuts China has made in industries like steel, coal and aluminum pale in comparison to the quantities China continues to flood the global market with, and China has no incentive to stop producing steel and aluminum at those levels for fear of what it could do to the Chinese economy. As long as that is true (and even if Xi’s reforms are wildly successful, it will be true for many more years), there is not much the U.S. can do by itself. It would take a global boycott of cheap Chinese steel and aluminum to move the needle – not a few impressive sounding tariffs. The Trump administration is not the first to notice the trend of Chinese oversupply, nor is it the first to attempt to enact tariffs and set quotas to combat it. Previous administrations, Democratic and Republican alike, also attempted to address the problem. What makes the Trump administration unique is that it would be the first to use Section 232 as a way to solve an oversupply problem driven by China, or, in layman’s terms, the first to make this an issue of national security, and not simply economic policy. The Trump-Xi agreement on North Korea and the release of a National Defense Strategy identifying China and Russia as America’s most significant geopolitical rivals now seem like intentional moves to cast China as a national security threat so serious that powers should be granted to the U.S. president to protect key industries to combat the threat. No more multiyear protestations at the World Trade Organization – instead, harsh tariffs and import quotas from the White House itself. Lost in all of this is the potential impact it could have on countries other than China. Take Canada, for example, which is currently engaged in turbulent negotiations with the U.S. and Mexico over reforming parts of NAFTA. Canada could stand to suffer greatly if Trump follows through on some of the Commerce Department’s recommendations, such as a 24 percent tariff on all U.S. steel imports. (The U.S. share of Canadian steel exports is a whopping 83.7 percent, to give a sense of the challenge such a move would pose.) A Trump decision to impose a quota of 86.7 percent on all aluminum imports would hurt China and Russia, but it would hurt Canada far more, and would also cause pain for countries like the UAE, Mexico and Germany, to name just a few U.S. allies and partners. Mexico in particular has a lot to lose if the U.S. pursues a hard line, considering that Mexico has become a common resale market for cheap Chinese exports like steel and aluminum. There is still a long way to go yet domestically – Trump has to choose what policies, if any, he wants to enact, and that choice, in turn, has to be upheld by the judiciary in the inevitable lawsuits that would follow. But what is clear now is that Trump will try to use access to the U.S. market as a weapon against enemies and leverage over allies. Using an obscure law to make economic policy a matter of national security during peacetime (or relative peacetime) is a profound shift in how the U.S. interacts with the global economy, and while it might lead to boosts in certain industries at home, it won’t put a dent in the underlying problem of low prices caused by global oversupply. Even so, it gives Trump significant powers over two major industries, and if it proves to be a successful template, the administration may seek even more wide-ranging powers. Beijing is no doubt alarmed – but so are Ankara, Ottawa and Brussels.